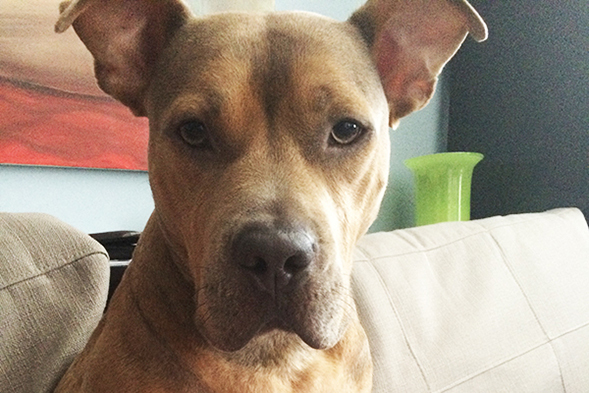 Pit bulls are one of the most common—and most commonly misunderstood—dog breeds in America. Though they get a bad rap, the truth is that these intelligent, affectionate dogs have a lot of love to offer to the right adopter, and Boo Boo was no exception. Rescued from abuse, this sweet dog overcame his tough past and let his happy-go-lucky personality shine. Here is Boo Boo’s Happy Tail. Boo Boo came to the ASPCA in February 2014. Rescued by a police officer as part of our partnership with the NYPD, Boo Boo was discovered abandoned and emaciated in the Bronx, New York. He was skeletal, starving, and covered in pressure sores on various areas of his body. At the ASPCA Animal Hospital, he received immediate medical attention and was put on a supervised diet to recover strength and lost weight. Over the first four weeks in our care, Boo Boo’s health progressed steadily. In addition to regaining some weight, he received specialized treatment for his skin sores and antibiotics to help fight infections. By the beginning of March, he was a healthy 47 pounds and ready to start his search for a forever home. On April 1, we received the good news: Boo Boo had been adopted. Unfortunately, our joy was short-lived. After being adopted, Boo Boo was returned two days later. The adopter told us that Boo Boo had been wonderful, but his landlord was afraid of Boo Boo’s size and appearance and forced him to return the dog. Though he had done nothing wrong, Boo Boo was back at our Adoption Center hoping for a home. Fortunately, Boo Boo’s wait was worth it. On April 12, Miguel S. walked through our door searching for a friend. “I was ready for a companion,” he says, “and I wanted to adopt rather than purchase a dog.” After meeting some of our available animals, Miguel spotted Boo Boo. He recalls, “The way he looked at me…I cannot explain it exactly! He was the third dog I saw and the only one I wanted!” He adopted Boo Boo that day and changed his name to Kaine. The new duo headed home to begin their new life together. Back at Miguel’s apartment, Kaine proved what we had known all along: He is an amazing dog. Miguel says, “Kaine is very much adjusted at home, but I don’t really go anywhere unless he is coming with me.” The two pals spend a ton of time together, and Kaine recently experienced his first ride in an NYC taxi cab and his first visit to the beach. Looking at Kaine today, it’s hard to tell that he ever suffered at the hands of abusers. 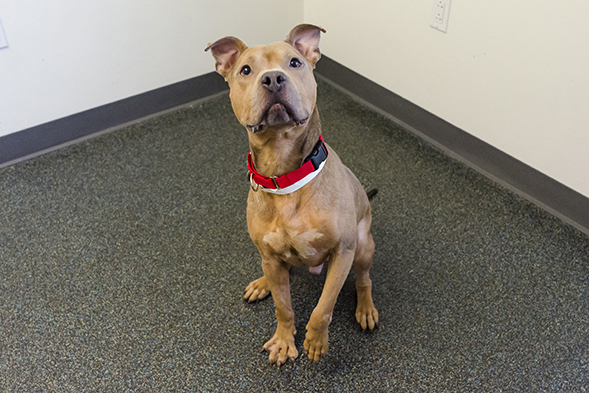 Like many pit bulls, his “tough” exterior is quickly overcome by his sweet personality. He is a goofball and a total lover, and Miguel describes him as “the best decision I’ve ever made.” We are so grateful that Miguel could look beyond the stereotype and see Kaine for the caring companion he was meant to be—and we know that Kaine feels exactly the same way.